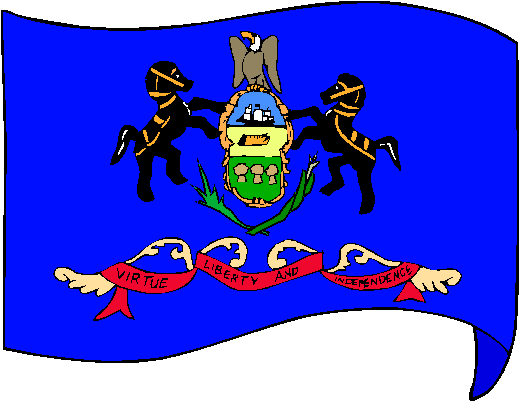 The flag of Pennsylvania depicts the state coat of arms on a blue field (of the same color as the United States flag). Surrounding the coat of arms are two draft horses and a bald eagle, the latter representing the United States. Beneath the coat of arms is a stalk of American corn on the left and an olive branch on the right (representing the state's past and future respectively), and a scroll bearing the text "Virtue, Liberty and Independence" (the state's motto). Flags bearing the state's coast of arms have a long history in the state, the first of which was authorized in 1799. During the American Civil War (1861 to 1865), many Pennsylvania regiments carried flags modeled on the U.S. flag but having the state's coat of arms in place of the field of stars. The current version of the flag was adopted by the Pennsylvania General Assembly on June 13th 1907.